Republicans are America’s Real Enemy! 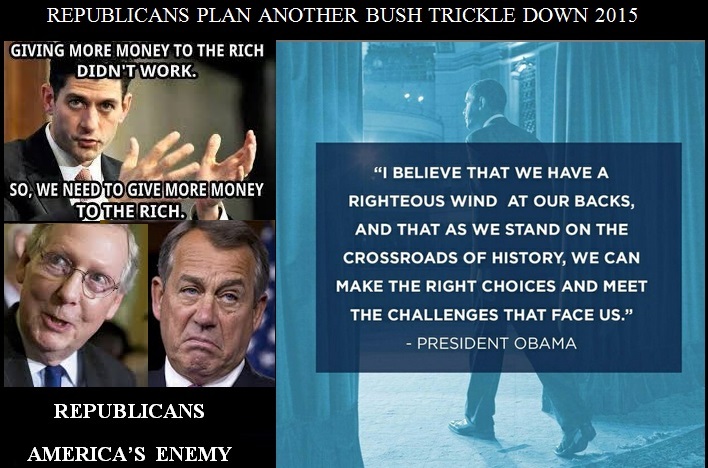 GOP Plans Another Bush Trickle Down Assault In 2015! President Obama spent six years digging us out of the ditch Bush threw us into, and now the newly control GOP House and Senate is about to toss us back into the ditch in 2015. As Republicans prepare to take control of Congress in a couple of weeks, after eliminating women’s reproductive rights, blocking the President’s executive action on immigration enforcement, and thwarting normalized relations with Cuba, they plan to revert back to Bush-era trickle down tax policy. In fact, very high atop the GOP’s agenda is reforming what they call “the highly unpopular federal tax code” to better serve the rich and corporations and express their thirty year love affair and devotion to “trickle-down” economics. However, some Republicans are beginning to express little hope that the President will go along with the scam and may eschew raising taxes on the poor, for now, and instead set their sights on slashing corporate taxes. The Republican’s favored scheme is cutting taxes for the rich and simplifying the tax code for everyone else by expanding the tax base; translation – raise taxes on lower income Americans including those living in poverty and elderly Americans living off their meager Social Security retirement income. Republicans have also floated eliminating popular deductions for middle-class taxpayers thus raising their tax liability to fund corporate and rich Americans’ tax cuts. However, with the President’s intent on protecting the middle and lower class income earners, Republicans will likely put all their focus on corporate tax cuts. Republicans complain that America has highest official corporate tax rate in the world at 35%, but U.S. corporations actually only pay an effective (real) federal tax rate of 12.6% as of 2010 according to Government Accountability Office. Even when foreign, state and local taxes were taken into account, the companies paid only 16.9% of their worldwide income in taxes in 2010. But that is too high for Republicans. Cutting the official corporate rate will bring the effective rate closer to 1-2 percent, but even that rate is far too high for Republicans and their corporate donors according to their stated intents. 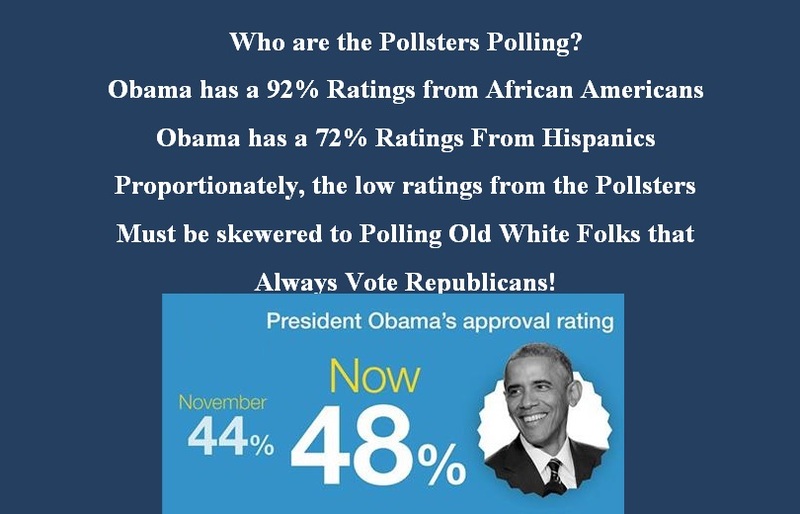 When it comes to President Obama, just who are the Pollsters Polling? CNN prior to the Mid-Term was told by their god “Money” that the world was ending with Ebola and ISIS. Fox News was told by their god “Benghazi” “Hate” and “Racism,” that the world was also ending. Since the end of the Mid-Term, Ebola, ISIS, Benghazi seemed to have vanished! Why? Honolulu (CNN) — Improving views of the economy have helped hike President Barack Obama’s approval rating to a 20-month high, a new CNN/ORC poll showed Tuesday, as markets climbed to record levels at news of an economy in overdrive. More Americans still disapprove of the job Obama is doing as President. But at 48%, Obama’s approval rating is at its highest point in CNN polling since May 2013. The gains were driven by newfound backing among women, independents and millennials — groups where Obama’s approval numbers jumped 10 percentage points from a month ago. 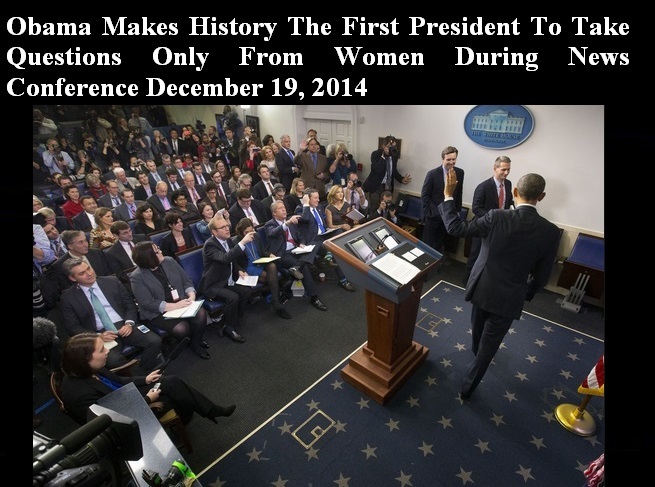 Meanwhile, Obama’s approval numbers ticked down among men, Republicans and Americans between 35 and 49 years old. The approval jump follows a late-quarter jolt in Obama’s governing agenda, which gained momentum after unilateral actions on immigration and relations with Cuba. Separate surveys have showed those moves popular among the American people. It all amounts to some welcome good news for Obama, whose unpopularity — despite consistently improving economic conditions — led to widespread losses for his party in November’s midterm elections. Tuesday’s poll still reflected pervasive disaffection for Obama: 56% of respondents said the President has fallen short of their expectations, and 49% said his policies would take the country in the wrong direction. The steady economic recovery has posed a conundrum for the White House, which wants some credit for decisions that helped pull the country from last decade’s recession. To the frustration of Obama and his aides, polls until recently showed Americans largely pessimistic about the country’s financial state, despite solid job growth and a bull market on Wall Street. In public remarks — even those unrelated to the economy — Obama has touted the latest positive economic sign. But even as the unemployment rate dipped below 6%, a large portion of Americans were still gloomy about the economy. That’s because of how people felt about their own economic standing, which for many still includes stagnant wages or jobs in low-paying service fields. President Ronald Reagan May 20, 1988: By giving its advice and consent to ratification of this Convention, the Senate of the United States will demonstrate unequivocally our desire to bring an end to the abhorrent practice of torture. With a view to receiving the advice and consent of the Senate to ratification, subject to certain reservations, understandings, and declarations, I transmit herewith the Convention against Torture and Other Cruel, Inhuman or Degrading Treatment or Punishment. The Convention was adopted by unanimous agreement of the United Nations General Assembly on December 10, 1984, and entered into force on June 26, 1987. The United States signed it on April 18, 1988. I also transmit, for the information of the Senate, the report of the Department of State on the Convention. The United States participated actively and effectively in the negotiation of the Convention. It marks a significant step in the development during this century of international measures against torture and other inhuman treatment or punishment. Ratification of the Convention by the United States will clearly express United States opposition to torture, an abhorrent practice unfortunately still prevalent in the world today. The core provisions of the Convention establish a regime for international cooperation in the criminal prosecution of torturers relying on so-called “universal jurisdiction.” Each State Party is required either to prosecute torturers who are found in its territory or to extradite them to other countries for prosecution. In view of the large number of States concerned, it was not possible to negotiate a treaty that was acceptable to the United States in all respects. Accordingly, certain reservations, understandings, and declarations have been drafted, which are discussed in the report of the Department of State. With the inclusion of these reservations, understandings, and declarations, I believe there are no constitutional or other legal obstacles to United States ratification. The recommended legislation necessary to implement the Convention will be submitted to the Congress separately. 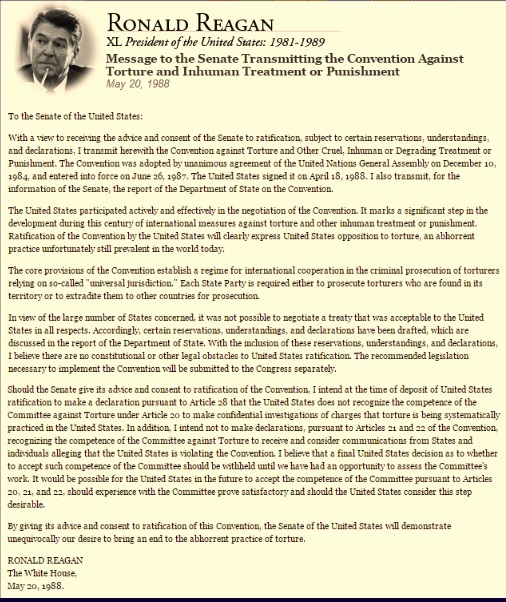 Should the Senate give its advice and consent to ratification of the Convention, I intend at the time of deposit of United States ratification to make a declaration pursuant to Article 28 that the United States does not recognize the competence of the Committee against Torture under Article 20 to make confidential investigations of charges that torture is being systematically practiced in the United States. In addition, I intend not to make declarations, pursuant to Articles 21 and 22 of the Convention, recognizing the competence of the Committee against Torture to receive and consider communications from States and individuals alleging that the United States is violating the Convention. I believe that a final United States decision as to whether to accept such competence of the Committee should be withheld until we have had an opportunity to assess the Committee’s work. It would be possible for the United States in the future to accept the competence of the Committee pursuant to Articles 20, 21, and 22, should experience with the Committee prove satisfactory and should the United States consider this step desirable. By giving its advice and consent to ratification of this Convention, the Senate of the United States will demonstrate unequivocally our desire to bring an end to the abhorrent practice of torture. 100% White Guy George W Bush January 20, 2001 – January 20, 2009, trashed America; 50% Black Guy President Obama dug us out of the ditch, however, not all, but many White Americans of all ages, gives Obama the lowest of Ratings. January 20, 2001, the national debt was $5,727,776,738,304.64. January 20, 2009, the national debt was $10,626,877,048,913.08. Growth of the National Debt under Bush: $4,899,100,310,608.44. Annual growth of the National Debt under Bush’s: $612,387,538,826.05. Under George W Bush phantasmagoric rationales and internecine Orwellian Policies the Stock Market Crashed; The Housing Market Crashed; Our Financial Institutions either crashed or were in serious problems and the our Financial System was on the verge of turning us into a Banana Republic. Unemployment reached 10.2%; spending was 8.9% of our GDP; Our GDP growth was -5.8%; Consumer Confidence was 34%. During much of Bush’s tenure, he had a Republican majority in both the House and the Senate that assisted Bush in this derangement. And now, the same American People, about 90% of the Country that lost almost everything, the majority of them are the same voters that have returned The House and Senate to the reckless Republicans that wrecked their lives. Amazing isn’t it! Under President Obama’s Policies the Stock Market is at Record Highs; The Housing Market Rebounded; Our Financial Institutions are stable and our Financial System is on solid concrete footing; Unemployment is 5.8% with over 10.3 million new jobs; spending is 2.4 of our GDP; Our GDP growth 4.1%%; Our Annual Deficit is 5.65% and Consumer Confidence is 93%. 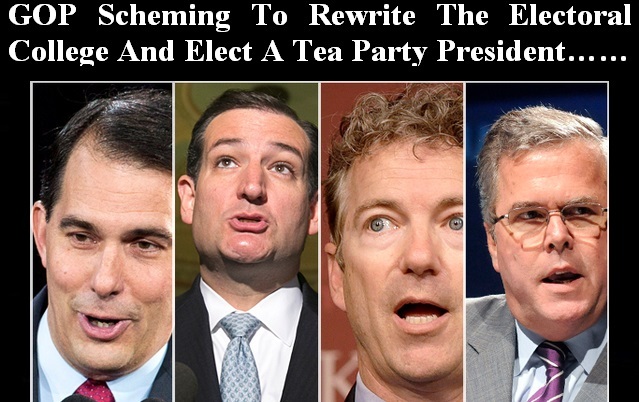 Now they’re trying to steal 2016: The demented GOP schemes to rewire the Electoral College and elect a Tea Party president! Republicans know they can’t win the popular vote. You won’t believe sick schemes they’ve launched to get around it. Republicans have only won the popular vote for president once in the last 25 years, a steep decline in their fortunes from the period from 1972 to 1988, when they won the popular vote every time but one–1976, the aftermath of Watergate. Add to that massive policy failures and demographic trends against them, and the motivations to cheat are overwhelming. Voter suppression seemed promising at first—and it’s helpful in many downticket races—but it’s not going to be enough to secure the White House. So they’ve been working on another idea as well—make the popular vote totally irrelevant by leaving red states just as they are, with statewide winners getting all the electoral votes, while making electoral votes more or less proportional in as many blue states as possible—many of which the GOP controls at the state level. If they can rewrite the rules fast enough, they could even win in 2016, with no more votes than Mitt Romney received.